Two years after a 7.8-magnitude earthquake hit poverty-stricken Nepal near the capital city of Kathmandu on April 25, 2015, reconstruction efforts remain spotty and sluggish. The quake killed more than 9,000 people, injured more than 23,000, and caused major damage to property and infrastructure. More than a million houses and 8,000 schools were damaged or destroyed, impacting up to eight million people; 700,000 people fell below the poverty line. Government buildings, hospitals and clinics, roads and bridges, power plants, and water supplies were devastated, along with the Himalayan tourism industry. Less than 20 percent of the ruined homes have been rebuilt. Progress in reconstruction has been hampered by rugged terrain, interrupted communication, logistical challenges, bureaucratic red tape, political infighting, insufficient building materials, poor management of funds, and a six-month blockade on the Nepal-India border that prevented the delivery of badly needed supplies into the country. Recovery has also been delayed by a severe labor shortage caused by migration of nearly 1,500 more male workers every day to Indonesia, Malaysia and the Middle East. At least one family member in every three Nepali households lives and works in another country to support their relatives at home. Long, strict contracts and the high cost of travel mean families may be separated for years. To resolve the housing shortage within five years, Nepal would need 60,000 skilled engineers, carpenters and masons. Thus far, the Nepali Ministry of Urban Development, the Lutheran World Federation (LWF), and Islamic Relief Worldwide (IRW) have joined forces to train 90 construction workers in how to build quake-resistant buildings and equip them with new tools. 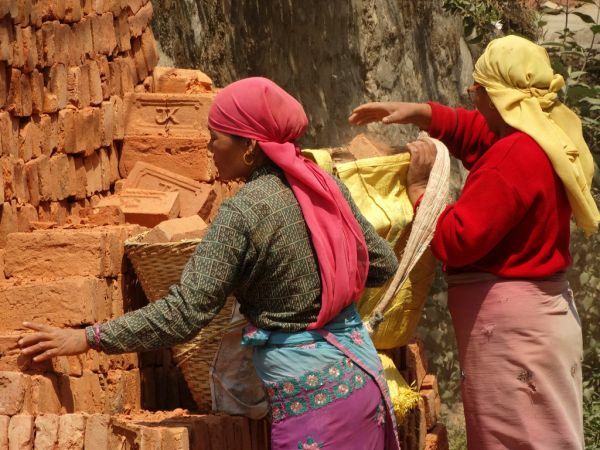 Because so many Nepali men are not available, the need to move quickly on reconstruction has opened a path for many women to learn skills in the traditionally male-dominated profession of construction. They are attracted by the chance to earn a decent wage, to help their families and communities, and to gain confidence by mastering new skills. Former farm worker Sanumaya Kumal is one of the women now working construction. "I am very happy with my job. I can do everything that a male mason can do," said Sanumaya. Binita, 20, was the only woman in the Dolakha district who trained to become a stonemason. "I was worried about taking on a traditionally male role. But once I received the knowledge I felt confident and knew I could do the work," Binita said. "Now I am proud to be a lady who supports her family and works as a female mason. I can be an example for all the young women who are jobless." Oxfam's country director in Nepal, Cecilia Keizer, commented, "Very often in these rural areas there are not many men left, and that empowers women because they have to take care of everything." LWF Nepal field worker Madhu Suman observed that initially women were reticent to speak up at meetings, but "the earthquake pushed them out of their comfort zone. The women are now quite vocal, and lead the efforts in reconstruction." One woman, Kabita Shrestha, 32, who used to hide in fear in her home when strangers came to her village of Sanogoan, now works full time making bricks, and regularly gives interviews to journalists. "The work is really difficult," says Purneshwori Shrestha. "Our bodies hurt after the brick making, and there is more work waiting at home. But there is no way back. If we want to rebuild our homes, we must keep going." In 2 Kings 4:8-37, we read about a wealthy childless woman who fed and housed the prophet Elisha at her own expense. In appreciation for her kindness, Elisha foretold that she would have a son, although her husband was already an old man. She gave birth in due time, and after the child grew older, he suddenly died. Elisha prayed over the boy and he was restored to life. Some time later, Elisha warned his patron to settle elsewhere, because there would be a famine in her homeland for seven years. She obeyed, relocating to Philistia until the famine was over, whereupon she returned home and sought to have her property restored to her. Question: How do you see God working in and through our world leaders? After Paul and Silas healed a slave girl, they were unjustly arrested, severely beaten and placed in maximum security in prison. Perhaps their bodies ached so much that they couldn't sleep. Instead of complaining, they turned to God, and their prayers and hymns ministered to their fellow prisoners. One might normally expect that an earthquake would not have any positive after-effects, but Luke writes that "immediately all the doors were opened and everyone's chains were unfastened" -- suggesting a future full of new beginnings, hope and liberation. God transformed what began as a very difficult, painful experience into an opportunity for witness to prisoners, the jailer and his household (who became followers of Jesus as a result), the police, the magistrates and the band of believers who met at Lydia's home. Questions: What doors might God open for you through trauma? What chains might God loosen when you go through a crisis? In this chapter, God condemns those who use holy days as occasions to oppress their workers for selfish ends rather than to feed the hungry, shelter the homeless, and clothe the naked. If they humble themselves, turn from their self-centered ways, and care for the needy, God promises to guide, provide for, and strengthen Israel. Hence, the pledge to rebuild what was ruined. But the pledge involves more than repair of buildings; the people themselves would become repairers of broken walls and restorers of neighborhoods where they could live safely by raising up foundations strong enough to support many generations. Questions: What broken infrastructures (real or metaphorical) might we be called to repair and rebuild? What steps can we take now to begin or advance such a project?